B Vitamins incl. Folic Acid -The vitamin B family offers a multitude of benefits! We’re talking weight control, cancer prevention, regulate glucose levels, and thyroid and hormone regulation. Natural vitamin B is found in poultry, eggs, fruits & veggies, leafy greens, beans, and whole grains. Folic acid (folate) helps your brain function, helps prevent cancer, reduce risk of high blood pressure, and helps aide in healthy reproduction. You can get these via supplement or eating leafy greens, lentils, and beans. Omega 3-6-9– Omegas are extremely important for brain functionality and overall health. If you eat Walnuts and other natural forms of omegas then you can get away with taking only an Omega 3. I have allergies and cannot eat nuts or seeds, and therefore have to take an Omega 3-6-9. Omegas and Walnuts are currently being tested and have been successful in alleviating PCOS symptoms. Read about the PCOS Walnut Study. Chelated Chromium– Helps control insulin levels! PCOS sufferers usually have crazy insulin levels which wreak havoc on our weight, appetite and fertility. DHEA– Our natural DHEA declines as we age and a supplement to replenish this natural decline can help with weight loss, hormone regulation, fertility and moods. Read DHEA for PCOS post here. Cinnamon (Ceylon)– Helps regulate blood sugar levels, which in turn helps with other PCOS symptoms. DIM– Helps balance hormones, reduces acne, break down Estrogen, and helps with weight loss. You can get this naturally through eating about 2 pounds of leafy greens a day! I think the supplement version is much easier. Vitex– If you don’t have a regular period, then this might do the trick! It helps with progesterone levels. 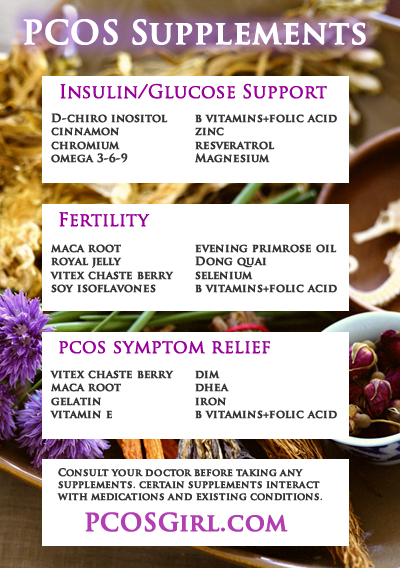 Many PCOS gals use Vitex to help them ovulate! Resveratrol– Enhances ovarian health, helps prevent cancer, and helps prevent insulin resistance. Naturally found in the skin of red grapes. Magnesium– Magnesium helps fight brain fog and fatigue! It also helps keep you regular- if you suffer from constipation. There are a few variations of magnesium- I opt for a multi-magnesium supplement. L-Arginine– This is one of the newer supplements I’m researching. L-Arginine helps our blood flow. It’s an amino acid that helps with female and male fertility. L-Arginine is also said to help with acne and decreasing inflammation. There are tons of other supplements, some have mixed reviews and some are not recommended by Dr’s. I have omitted those supplements. Let me know of what supplements & herbs work for you! This entry was posted in PCOS, PCOS Symptoms & Meds and tagged chromium, cinnamon, d-chiro, DIM, folic acid, inositol, iodine, l-arginine, Maca, pcos fertility, pcos supplements, pcos weight loss, resveratrol, vitex. I just purchased DIM. How much should I take per day and what dosage? Thanks for all this great info! Hi Stephanie! Take the DIM according to the instructions on the bottle or your physician’s instruction. Let us know if it helps you out!! Definitely talk to your doc! I had bloodwork done and then talked to my GP and my ob-gyn to get their opinion. I see a huge difference though when taking supplements and multi-vitamins- so for me they work! Hopefully they work for you too!!!! where can you get the d-chiro from? What brand do you use? You can buy them from Amazon or any vitamin store will carry them too. I typically buy all my supplements from Amazon, since I can read all the reviews. I know this is late- lol. But I added the link to the supplements I use in the article. Thank you so much for all the info!!! I recently received my diagnosed with PCOS. I have been dealing with all the systems since I can remember. But no one has ever even brought it up… I am seeing my OB tomorrow to discuss your post!! So glad you found an answer to all your symptoms!!! Supplements, exercise, and diet will help decrease your symptoms. Keep us posted!! Where did you buy the royal jelly?